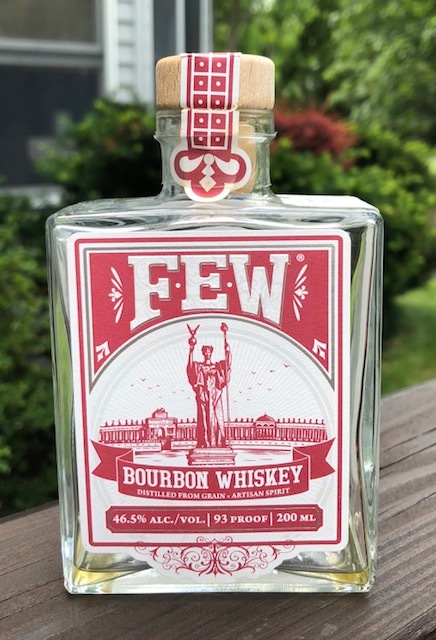 FEW bourbon, a local spirit that is not only on shelves everywhere, but also in nearly every venue, has simply not appealed to me. I first sampled it at the distillery maybe four to five years ago. While I enjoyed their rye a lot, I just didn't find anything to like about the bourbon. It had that flavor I get in young, craft bourbons so often--rotten apple. I can't seem to get away from it, and when it's there, it's all I notice. A couple years ago I gave FEW bourbon another try at a bar. Again, I got that young, rotten apple taste, and I was turned off again. At Christmas, however, a friend gave me this 200 ml bottle. Figuring it's been a few (no pun intended) years now, and the whiskey should be more matured than when I last tasted it, I figured I'd give it another go. Unfortunately, things haven't changed a whole lot. I was optimistic at first, as the nose was great. I got some caramel and baked apple that were delicious together, along with cinnamon spice. The nose was soft, inoffensive and inviting. When I went in for my first sip, even, I got brown sugar right up front. It was sweet and delicious. Unfortunately, it was closely followed by that not unfamiliar but completely unwelcome flavor of over-ripe apples that had turned brown. I wanted it to not be there so bad, but there it was, front and center. I will say, it did seem to be tempered a bit compared to past experiences. It wasn't offensive, it just wasn't good. On the back end I got a bit of a piney note as well. It wasn't quite a Pine Sol flavor, but rather a muted car freshener flavor (or at least what I assume one of those car fresheners would taste like if I ever ate one). This bottle was good for two solid pours. On the second pour, I noticed a peanut flavor as well. This new flavor wasn't bad, but was just odd when mixed with the other odd, not-so-great flavors of this bourbon. I wanted this bourbon to be good. I really did. But, I think I may be done giving it a chance. It's a shame that I just can't bring myself to like it. I think I'll just stick to their ryes from here on out, which they do very well.